It’s been quiet around here, online hasn’t it? I know you all think I’ve abandoned my site, or I’m lying in a ditch somewhere, but that’s not the case! I’ve just been really busy with another project that I’ll introduce here soon. It’s no excuse, I know. But I’m back and I have a couple of new recipes for the week. Somehow it’s January already, and January means resolution season. For lots of people that means detoxing from the Christmas cookies and New Year’s hangovers. For other people, it’s a pledge to eat at home more often and save money. Whether your resolution is physically or financially motivated, this recipe should help you keep your resolve while still eating well. Because if you’re not eating well this year, it’s not going to be a good one. The beauty of this recipe is that you can throw everything in a baking dish and stick it in the oven with minimal chopping and prepping. Chicken thighs, slices of orange and lemon, shallots, olive oil, salt and pepper. The shallots caramelize and sweet, while the citrus brightens the dish up. It’s a happy kind of dish and a wonderful way to start the new year. Place everything except the herbs in a baking dish and toss until evenly combined. Cover and marinate in the fridge for at least 30 minutes or overnight. Preheat the oven to 375°. Place the baking dish in the oven and cooke for 30 minutes, or until the chicken is cooked through and slightly brown. Depending on how cold your fridge is, you might need to cook it longer. Discard the citrus slices, sprinkle with fresh herbs and serve with your favorite side – salad, polenta, potatoes, or pretty much anything. Glad to see you are back in the kitchen, I have missed your recipes! Welcome back! The photo of the chicken dish is beautiful, and I love the idea of being able to use the abundance of citrus we have right now. Look’s light and healthy. Glad to see you are back. Yea!! Glad to see you’re back. I missed your recipes which have such a wonderful creative and [mostly :-) ] healthly vibe. Happy 2011! Do you think cilantro would be good in this? Welcome back. You were missed. Just wanted to let you know we tried your turkey breast with the bacon and pear jam and all the goodies in the middle. It was wonderful. The only bad part was there was not one leftover. I’m looking forward to more of your recipes in 2011. Ooooooh. Passing this to my hubby, who has a new passion for cooking. Welcome back! made it tonight and loved it. It seems wrong that something so simple can be so delicious! Nice yo have you back Mel . Welcome back … I too have missed your recipes, photos of, and commentary!! I made this for dinner last night for my husband, and we both loved it! I had bone-in pork chops in the fridge so we subbed those for the chicken (three large chops); and the citrus I used was one Meyer lemon, one regular lemon, two clementines, and one lime. I also added four small cloves of garlic and a handful of cranberries. I didn’t have any fresh herbs on hand so I skipped that step. The moment my husband took a bite, he started raving about how good it was; and he wants me to add it to the regular rotation. I served it with a plain buttered potato (and I fished out all the carmelized shallots and piled them atop the plated chops). So tasty! Glad to have you back in action! Love this dish! So easy and such a simple idea packed with color and flavor! Using the combo or oranges and lemons is a nice touch too – If someone just wanted to use one citrus fruit, I bet meyer lemons would be a good choice (kinda in between a lemon and orange) or even a touch of fresh tarragon would be a cool twist – although I do like the idea of cilantro from Beth above. I have been wanting to make this since you first posted it. I finally made it for dinner tonight and added some red chilies for a little bit of heat. Great dish. Thanks! Amazing! I am all about citrus with chicken. I just had fresh thyme and blood oranges, was really really tasty. I love your recipes…making the crumble pie again tonight but with apples instead. Looking forward to the chicken and serving it with rice and a spinach salad. Yum. Did you leave the baking dish covered while you baked it? Krista – No, I left it uncovered. It’s so nice to find great recipes that can be prepared (mostly) in advance. My husband’s currently using the oranges to bribe orioles to our deck, but I’ll sneak one out of his stash and try this chicken. Hello fellow food blogger! 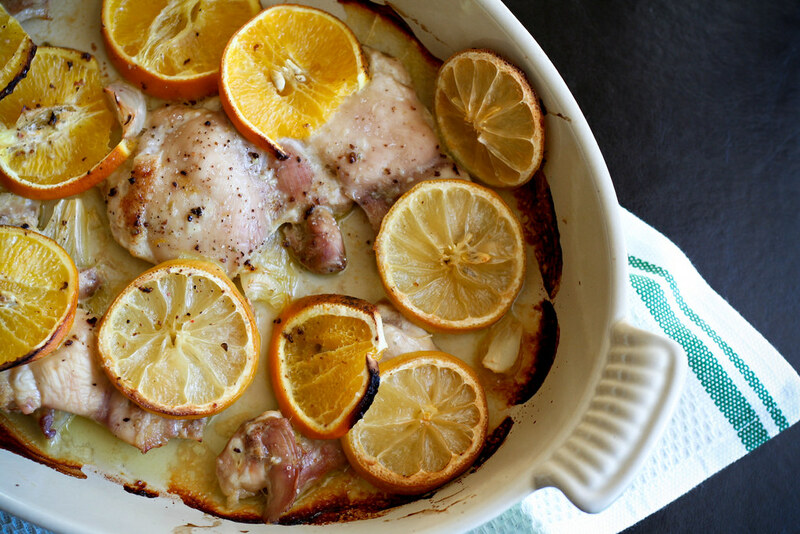 Love your blog and this citrus chicken is amazing. WOW! This broth is amazing. The coniomatbin of anise, coriander, garlic, and ginger was incredible. I made all kinds of substitutions based on the veggies I had on hand (including delicious mizuna greens), but the broth stole the show. It’s the kind of broth one would make a huge batch of and then freeze to have on hard for delicious and effortless week night soup bases Or reconstituting dried mushrooms? (Also, it seems like a great clean-out-the-fridge dumping ground for various veggies and proteins that need to get used up! )Thank you for this post! This will be an instant go-to in my repertoire.